Hours: Sunday, 11:30a.m. - 9pm; Monday, Tuesday, Thursday, 11:30am - 10pm; Wednesday, Friday, Saturday, 11:30am - 11pm Lounge open late. M-29 North of New Baltimore by land, 42.4140 N 82.4178 W by water. When you're in the mood for good times and great cuisine, be sure to check out Tin Fish Resort . The restaurant is located in one of the area's most pleasant settings and is known for its delightful staff and superb cuisine. The menu at Tin Fish Resort features a wide array of great selections, made from only the freshest and highest quality ingredients, with something sure to please every member of your group. Tin Fish Resort has established itself as one of the area's favorite culinary destinations and is sure to offer you a pleasant and unique dining experience every time you visit. 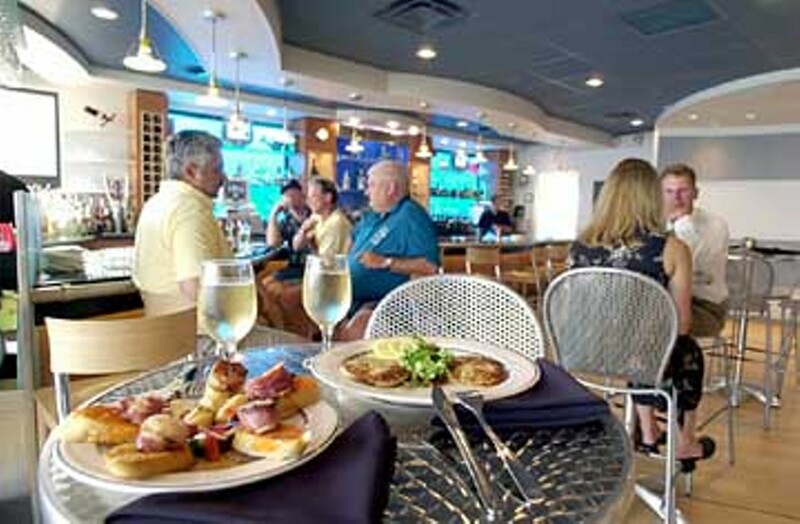 The Detroit News: Michigan's Best Outdoor Terrace Dining "Open the submarine-style portal to Tin Fish Resort, in Fair Haven, and you'll feel like sailing over the wide blue waters of nearby Anchor Bay. Perched a few stories above the shoreline, Tin Fish has three outdoor tiered decks, as well as a Tiki Bar, with live bands Wednesday through Sundays, beginning the Wednesday before Memorial Day. The indoor dining room is stunning, with a snaking bar that offers an aquamarine aquarium as backdrop. At the height of the sunshine season, Tin Fish feeds a sea of people angling for good food and good times. The solid, modern menu offers everything from angels on horseback appetizer (bacon-wrapped broiled sea scallops), escargot in garlic and burgundy, a truly memorable pasta trio with andoiulle sausage, chicken and shrimp, plus standards such as prime rib, surf and turf, and a sensational steak Oscar, topped with asparagus and bernaise. Tin Fish--pure-gold Fish." Entertainment: Live Music Wednesday, Friday and Saturday.